Dynamic soccer stretching– often used at the beginning of a warm up. Making circles with the arms to loosen the shoulders, twisting from side to side and swing each leg as if to kick a ball is all good examples. Ballistic soccer stretching– bouncing or ‘jerky’ movements that use your bodyweight to increase the stretch. Bending over and bouncing to touch your toes is a classic example. Avoid ballistic stretching. There are safer and equally as effective ways to improve range of motion. 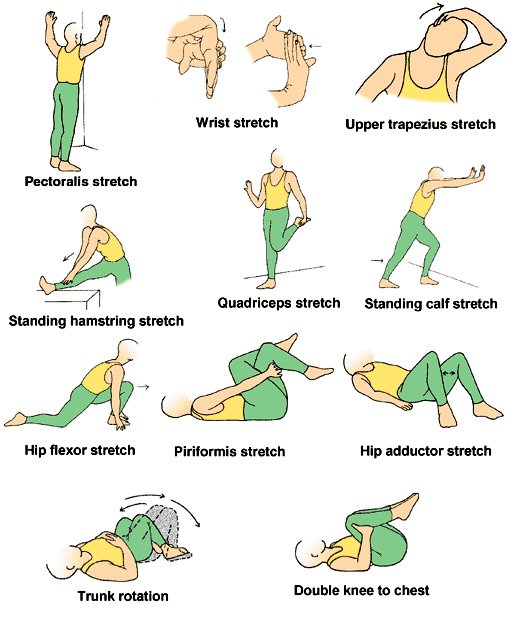 Static soccer stretching– muscles are stretched without moving the limb or joint itself. A good example of a static stretch is the traditional quad stretch where, standing on one leg, you grab your ankle and pull your heel into your backside. Breathe! Avoid breathing holding as you stretch as this can raise blood pressure and leave you feeling dizzy. 1. Standing one leg, grab your opposite ankle and pull your heel into your buttocks. 2. Your bent knee should sty parallel with your standing leg rather then being pulled behind. 3. Push your hips out to increase the stretch and remember not to grab the ankle joint. 3. Gentlyuse your hands or elbows to push your knees downwards. 3. Turn your upper body towards your right knee and place your right hand on the floor for support. 4. Place your left forearm on the outside of your right knee and gently pull your knee towards you. 6. Repeat for the opposite side.